7" featuring two tracks from the Slimkid3 & DJ Nu-Mark self-titled album. "In an age of slammin' superhero crossovers, get ready for a hip-hop team-up to beat them all: Slimkid3 & DJ Nu-Mark! With the Delicious Vinyl release of their album-length eponymous collaboration, the legendary Pharcyde MC and Jurassic 5 DJ/producer have created a soulful Hip-Hop soundtrack for the ages. 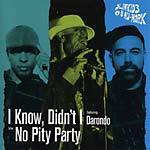 The new album's standout tracks include 'Bouillon' featuring Del and Murs, 'King' featuring Diamond D, reggae-fueled summer jam 'Bom Bom Fiya', and presented here 'I Know, Didn't I', a savvy flip of Darondo's soul classic."